Iowa Workers’ Compensation Reporting Requirements | Hupy and Abraham, S.C.
Workers’ compensation benefits—like most insurance recoveries—involve a certain amount of paperwork. You are required to report your injury to your employer, and in turn your employer is required to report your injury to the state. 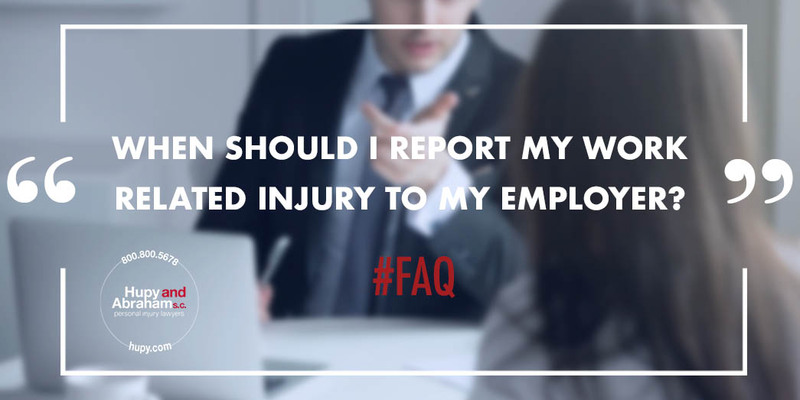 You should report your injury to your employer as soon as possible after your accident. If you are unable to make the report, then someone else—such as a spouse or friend—may do so on your behalf. You have no more than 90 days from the time you knew or should have known that you were hurt in a work-related incident to make your official report to your employer. However, as with any injury claim, it is important to make your report as soon as possible so that you can get medical care and other benefits as soon as possible. What Should Your Notice Look Like? You are hereby notified that on or about the … day of …… (month), … (year), personal injury was sustained by ……………, while in your employ at …………… (Give name and place employed and point where located when injury occurred) and that compensation will be claimed therefor. Thus, you may use the form specified in the statute or any other method that provides the same information. You are not responsible for this part of the reporting requirement, but you might be interested to understand how it works. Employers are required to keep records of any injuries or fatalities that an employee alleges happened in the course of employment and that result in incapacity for more than one day. If the injury results in a temporary disability for a period of more than three days, then the employer must file a report with the workers’ compensation commissioner within four days (excluding Sundays and legal holidays) from when the employer was provided notice of or knew of the incident. If the injury results in a permanent disability or death, then the employer must file a report with the workers’ compensation commission within four days of having notice of or knowledge of the permanent injury or death. Thus, more than one report may be required for a single incident. An employer who fails to comply with the reporting requirements may be fined. Reporting injuries is just one step in the complicated process of making a fair workers’ compensation recovery. If you have other questions about how a workers’ compensation case works in Iowa or what you should do after a work injury, then we encourage you to contact us directly via this website or by phone for a free and confidential consultation.